11:42 Style: Recycling for coffee addicts: used coffee creamer turned perfect sugar dispenser. 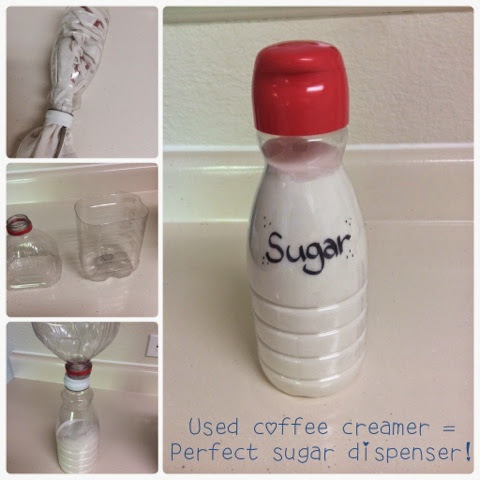 Recycling for coffee addicts: used coffee creamer turned perfect sugar dispenser. Re-purposing used items is always a good idea imo. It saves a lot of energy and waste, and even a little money. That way I have more money to invest in my wardrobe lol. One of the easiest things to re purpose are coffee creamer containers. When you think about it they are actually really functional because the pouring lip makes them a great dispenser of any kind and the lid keeps things dry. The hardest part is getting the inside perfectly dry. I ended up putting and entire dish towel inside and moving it around with a butter knife. I didn't have a funnel on me so I made one out of a clean juice container. I've even read that some people use them for water bottles but I haven't tried that one yet. They are BPA free but I am not sure how well they prevent leaks. Here is a super cute idea for turning them into Elmo party favors from Susan House on Pinterest. Too cute!